Aninhado nas árvores na junção de onde o lago Kootenay flui no braço ocidental do lago Kootenay em Balfour. Apenas uma curta caminhada até o desembarque da balsa, que vê muitas lojas, padaria, comida e restaurantes. Nossa propriedade tem um deck muito amplo, onde você pode sentar e assistir a balsa que viaja entre Balfour e Kootenay Landing na costa leste do lago. Há uma fogueira que é incrível para as noites frescas e para assar cachorros-quentes! Todos esses cursos oferecem uma experiência de golfe de primeira classe! Kootenay Lake também é excelente para a pesca. Ainsworth Hot Springs fica a apenas 15 minutos de carro e a cidade histórica de Kaslo fica a 30 minutos de distância. Kokanee Glacier Park 15 minutos para Nelson, então, claro, a cidade de Nelson, com suas diversas atrações. Beautiful location for family fun. 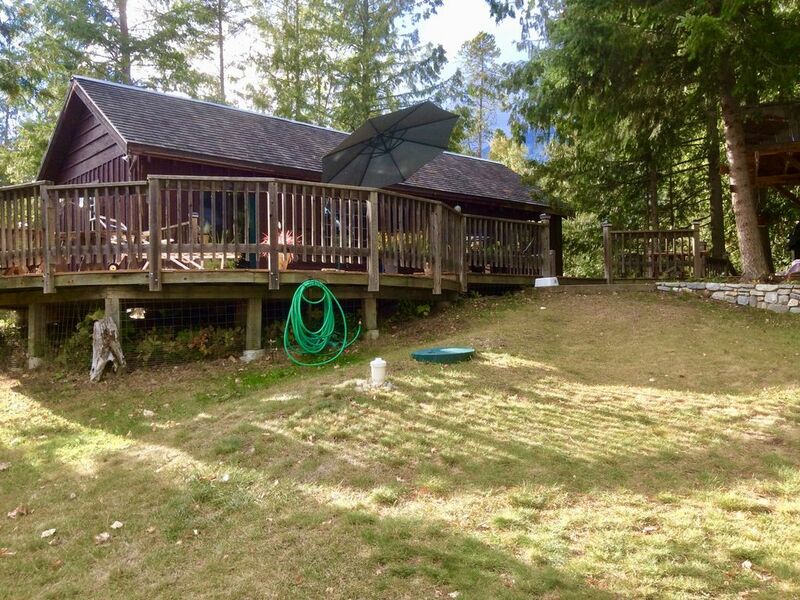 House has everything you will ever need while still maintaining a cottage feel. Little shops, casual restaurant, coffee and pastry easy walking distance. Equal distance between Nelson and Kaslo for day trips. Watching the ferry go by regularly was just icing on the cake. Bring your water shoes the beach is rocky, and kid and adult movies if that is something you want on holiday. Would go back in a heartbeat! We loved staying at this cabin. The owner has it outfitted with just about everything you could need including a large collection of beach toys. The beach was large and the water had a nice sized shallow area, perfect for our toddler to safely play. I wish that we had been able to stay longer! Cherie has a great house on the Kootenay lake. It is well laid out, well equipped, great location and everything you need for a restful but eventful holiday. We had a great time with young kids and dogs. I hoped this remained a well kept secret so it would be easy to book in the future but it's just too good to keep to ourselves! It's a little slice of heaven. Loved every little thing about this place. My kids and I stayed a week, every meal was prepared in the kitchen here, which was fully equiped with anything i ever could have needed, and eaten on the massive amazing deck outside. The beds and other furniture are all so very comfortable. There wasn't a single day where we were bored. Perfect location to get anywhere really! The 1 and only thing I wish was different was the beach... it is quite rocky. But the water was refreshing and the sun was warm!! Will absolutely be recommending this place to others and will most definitely be back to stay here again one day!